A few weeks ago it was my niece's 2nd Birthday and I thought that I would make something a little special for her. I am super excited about this make as its right up my child-like-brain street and have been asked to make many an adult version since - shows my friends have a similar philosophy to me! I found this bright Purple H&M hoodie a few weeks ago and was just working out the right thing to do with it. 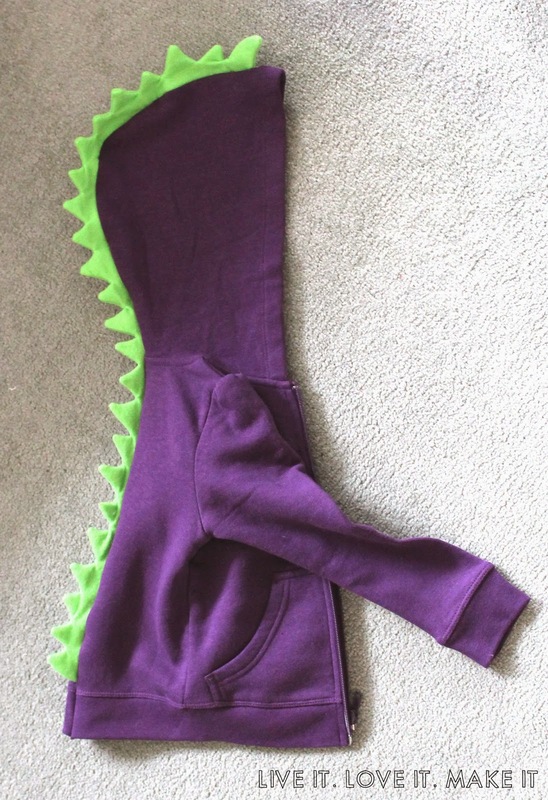 A bit of bright green felt meant that I thought of just the thing, making it into a dinosaur hoodie - of course! Hoodie/ Jumper, coloured felt (length of the hood and back in one), threads, sewing machine, scissors, pinking shears, ruler, tape measure, black sharpie pen, seem ripper and a chalk pencil/piece of tailors chalk. On the hoodie I chose, there was a back seem on the hood and so I ripped the seem, keeping the tip of the hood in place as it was overlocked and it made for a neat seem. Using a ruler (as my cutting is not straight) and a chalk pencil draw a line down the back of the hoodie from the centre line on the hood. Now to make the dinosaur spine. Measure from the tip of the hood right down the back of the hoodie to get the right length for your spine. I added a few extra centimeters just in case. Using a black pen draw on your felt the shape of your spine, make it to the desired length. Now cut a second piece of felt to the right length and so you have two sides. I tacked the two pieces together (using a white thread and a long stitch) as I feel that this helps to keep it all together much easier than pins for such a long length. Then with a matching thread, follow your pen lines with a straight stitch, to make your spine. When you are making zig-zag shapes it is worth keeping your needle in the fabric at the change of direction points and so you can swivel it around to the next direction. Once you have sewn all your spine, you can unpick the tacking and then follow the sewing line with your scissors to get rid of any excess fabric. Cut off the tip of the triangles (making sure you don't cut through the sewing) so that when you push it through, the tips are sharp. Pull through the spine to the right side and using a pencil or fat crochet hook (like me) you can push through the triangles so that the tips are as sharp as possible. Then again, I tacked around the bottom edge and so the next step became easier. Attatch your spine to the hoodie by putting the felt against the right side of the hoodie at your cut edge, making sure the triangle spikes face into the hoodie. Follow the edge of your cut middle part of the hoodie and pin into place. Then put the other half of the jumper on top, making sure that any join points are in the same place and keep the bottom of your hoodie in line with each other. I chose to tack this in place, but you can pin it if you prefer. 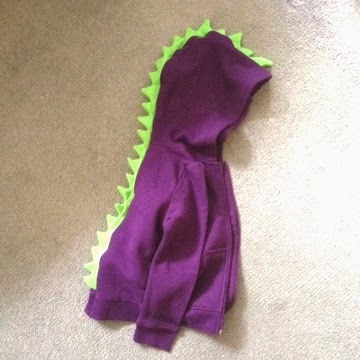 I used a matching purple thread and a zig-zag stitch along the length of the hoodie, making sure I kept all the layers together. The zig-zag stitch will keep it nice and firm into the hoodie. Fold it around to the right side and you can see what you have done! You can also make sure that the spine is in the right place and that it looks right before you look on the inside, cut all the threads and using pinking shears cut the excess felt from the spine. You will then end up with a hoodie that looks a little like this! You can change up the colours however you like and make the spine thicker or larger as you want it. I then saw that Jenni on The Sewing Bee made something similar in the customisation challenge and so it must be cool to make one! If you have a go at something similar let us know via Instagram or Twitter using the #livelovemake. We love seeing what you get up to. Thanks Rhiannon. I think quite a few of my friends children will be getting one of these this year! My new favourite thing! Meena loves it and has been proudly wearing it to nursery after demanding her dinosaur coat in the morning. All the nursery staff love it too and want adult versions!! !